Home of the New Forest, the South Downs and miles of beautiful coastline, Hampshire makes a near-perfect glamping destination. There are ten national parks in England and two of them can be found within this southern county. That’s pretty good going as far as we’re concerned. One is the magical New Forest with miles of heathland, woodland and the other is the South Downs (or at least part of it) with amazing walking amid chalk hills. Both have long been destinations for campers and these days they are just as well-known for their excellent glamping sites. Then there’s the coast: Hampshire is home to the big ports of Southampton and Portsmouth but there are some special places in between too, including nature reserves and country parks. With the national parks and coastline stealing the headlines, visitors to Hampshire sometimes overlook the other areas of beautiful countryside like the Test Valley where rolling chalk hills and water meadows characterise the landscape around the River Test. Hampshire is also home to the historic city of Winchester and plenty of picturesque villages, including Stenton and Chawton with their links to Jane Austen. We've been visiting heaps of glamping sites in Hampshire over the last few years to bring together a collection of the very best. 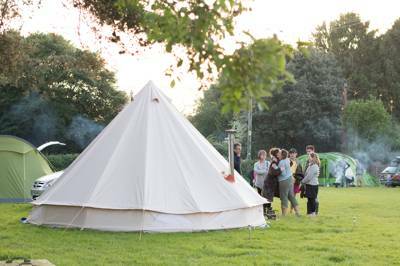 Whether you are interested in bell tents, tipis, yurts, safari tents, shepherd’s huts or treehouses you can browse the Hampshire glamping options below to find the accommodation that suits you best. Some would say it’s all about location, location, location when it comes to choosing where to holiday but with glamping there’s also the question of what type of glamper you are. Some will choose a glamping holiday because they simply don’t fancy pitching a tent but still want the freedom of camping. Others will go for glamping because they have been seduced by the idea of candles and campfires – but don’t fancy sharing a bathroom. Luckily, all types of glampers are catered for today: starting with simple bell tents and camping pods and ranging all the way to luxurious shepherds huts and safari tents with hot tubs and more. There are plenty of quirky glamping options too from modern geodesic domes to traditional gypsy caravans, log cabins, and vintage caravans. If you are planning a family glamping holiday in Hampshire, you’ll want to make sure you choose glamping accommodation that’s suitable for all family members. You might prefer somewhere with a bit more space or that’s close to the toilets if you have young kids who are likely to wake you up in the middle of the night, for example! You’ll probably manage to make sure there’s a bed for everyone but be aware that many glamping sites only provide bedding for the double beds as standard. You may need to let your glamping site know if you want extra bedding or, for example, a travel cot for tiny tots. 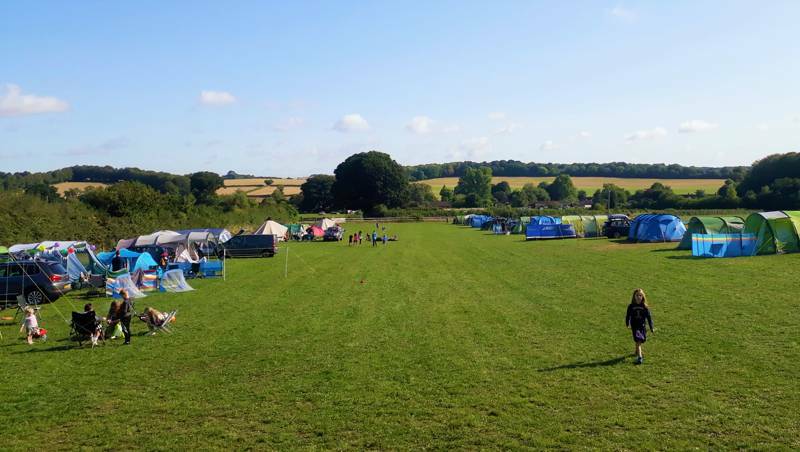 There are plenty of great family glamping sites in Hampshire: sites with activities and play equipment that’s just for kids and sites on farms where watching the goings-on will keep children amused for hours. But wherever you choose to base yourself for a family glamping holiday in Hampshire, you can rest assured that days out will be just as much fun as the glamping itself. If your children love animals and being outdoors, exploring the New Forest and spotting the free-roaming ponies will be a magical experience. If your tots are glued to the TV when Peppa Pig makes an appearance, imagine how excited they’ll be when you head to Peppa Pig World to meet her in real life. If it’s romantic glamping you are looking for in Hampshire or the New Forest you won’t be disappointed either. What could be more romantic than cosying up with your loved one in a yurt or shepherd’s hut warmed by a log burner? Look out for sites with secluded spots or places where there are only a few pitches if you want to keep it quiet. Another great tip is to take your break during the week when you might just get the place to yourselves. An adults-only break in Hampshire will give you time to get a few miles under your belt on the South Downs Way before a Hampshire ale or wine in one of the area’s many country pubs. You could also imagine yourself in the arms of your own Mr Darcy on the romantic walks through the areas that inspired Jane Austen. Choose the New Forest to explore the heather moorland by day and by night make the most of the dark skies above the national park with a bit of stargazing. It takes just 90 minutes by train to reach Hampshire from London which makes glamping in the New Forest temptingly easy for city dwellers – even if it’s just for a couple of days. They say a change is as good as a rest and the open-access land of the New Forest couldn’t provide a greater contrast to the urban area. A mixture of woodland and moorland, here New Forest ponies and cattle wander freely and there’s plenty of other wildlife too, including a wide variety of birdlife and, of course, the deer that the park is famous for: red deer, roe deer and fallow deer. The New Forest was created by William the Conqueror in 1079 as a royal hunting ground but, nowadays, you’re more likely to spot people armed with a pair of binoculars or tracking down an old-fashioned country pub for a delicious lunch after a bracing walk. There have been great camp sites in the forest for decades and now there’s glamping to match and with great walking, wildlife watching and towns and villages to explore it’s an outdoor lovers’ dream. Some of the best attractions in Hampshire, including Paultons Park and the National Motor Museum at Beaulieu, are within its boundaries too. The national park stretches down to the coast and there are country parks like Lepe where you can enjoy a combination of great countryside and sea views – not to mention nature trails, an adventure play area and café. Hampshire’s coastline is on The Solent, the stretch of sea that separates the Isle of Wight from the mainland and includes the ports of Southampton and Portsmouth. It’s a busy shipping channel but it’s sheltered waters are also a great place for sailing and water sports with the famous Cowes Regatta taking place every August so if you like glamping with a watery edge look for glamping sites near the Hampshire coast. From Gosport you’ll be able to take to the water on a sailing trip or try your hand at stand-up paddle boarding, kayaking, wind or kitesurfing. If you’ve got younger kids, there’s tamer, traditional seaside fun on Hayling Island – an island connected to the mainland by a road bridge across the sea, where you’ll find a fun fair and plenty of places for ice creams and fish and chips on the Blue Flag shingle beaches. 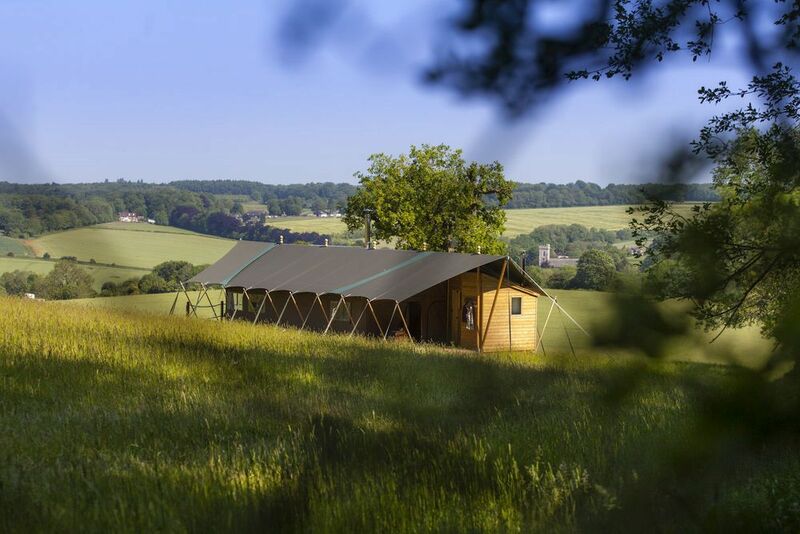 Glamping near the South Downs National Park gives you access to great walking, running, riding and mountain-biking trails, not forgetting unbeatable views. One of the largest areas of chalk downland in southern England, the South Downs are important for wildlife and wildflowers and for humans looking for a bit of fresh air. The hills, the national park and the 100-mile South Downs Way long-distance footpath across them, stretch from Winchester in Hampshire and across neighbouring Sussex to Beachy Head near Eastbourne. There are more than 670 square miles within the national park and it’s well worth exploring at least a few of them on foot, two wheels or on horseback. 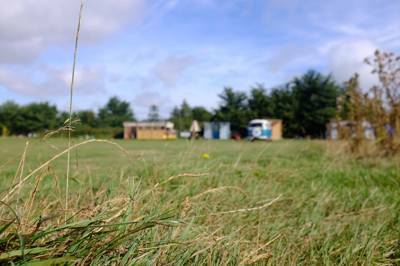 You won’t be short of things to see and do during a Hampshire glamping holiday. The county is full of attractions – both natural and manmade. The Visit Hampshire website is the source for official tourist information but with so much on offer, you might find it difficult to know where to begin. To give you a helping hand we’ve put together a Cool Camping top ten ideas of what to see and do during a glamping holiday in Hampshire. 1. Explore the New Forest. One of England’s smallest national parks but also one of the most magical. As you drive over cattle grids in to this protected park you enter another world of heather moorland and woodland where New Forest ponies and deer wander as freely as the walkers and cyclists they seem to outnumber. Visit the deer-viewing platform near Bolderwood Ornamental Drive for the best chance of catching sight of some of those deer. During the summer months the deer are fed here (usually between 12pm and 2.30pm) and so, although they are wild, they are less skittish than deer unused to human contact. There’s a car park and the start of some nice walks here too. Stock up in Lyndhurst, the “capital” of the New Forest (ie: the area’s largest village). Once you’d have found William the Conqueror here, now it’s home to the almost-as-important New Forest Visitor Centre. If you’re glamping in the New Forest this is the place to head to for a map and local tips. The independent shops of the high street are also a good spot for picking up local produce for picnics and barbecues. 4. Take a walk on the South Downs Way. This long-distance footpath offers a great way to explore the South Downs National Park. The trail begins in the historic city of Winchester and stretches more than 100 miles to Eastbourne in neighbouring Sussex. Perhaps stick to tackling just a short section during a glamping holiday near the South Downs! 5. See the Mary Rose. Henry VIII’s battleship, the Mary Rose, is carefully preserved at Portsmouth Historic Dockyard. It’s the only place in the world that you can see a 16th-century warship so it’s worth a visit for that alone but throw in Nelson’s HMS Victory and it’s a day out you won’t want to miss. 6. Spend the day at Beaulieu. A historic house, beautiful gardens, an old abbey not to mention the National Motor Museum. There’s a lot going on at Beaulieu, a historic country estate in the New Forest, which makes it a great place for a visit whatever the weather. 7. Enter Peppa Pig World. Okay, so this one is not for everyone but families with young children may get more than a little excited at the prospect of meeting Peppa and George face-to-face. Peppa Pig World is part of the larger Paultons Park where there are more than 70 rides and attractions which are suitable for all ages. 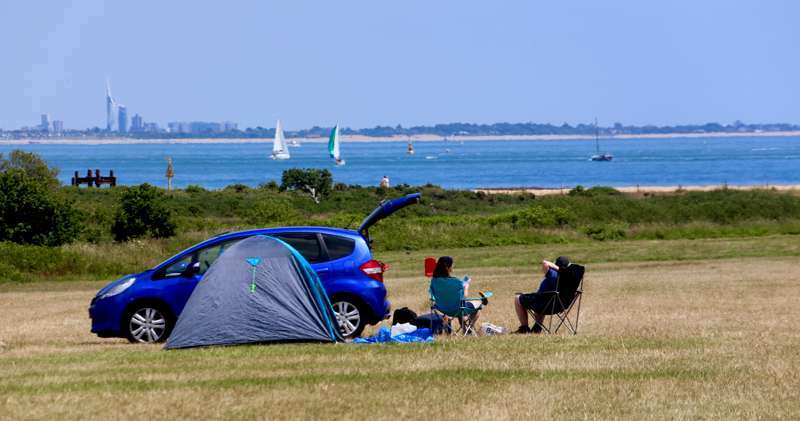 Head for Hayling Island for some traditional seaside fun while you’re glamping in Hampshire. Connected to the mainland by a road bridge that makes for an interesting drive, Hayling Island has all the fun of the fair at a small beachside amusement park. The Solent which separates the Isle of Wight from the mainland is the home of the famous Cowes Regatta which takes place in August each year. But you don’t need to be an expert to take to the water here. Visit Gosport to find out about boat trips that will give you the chance to take to the seas. 10. Try Test Valley trout. The independent eateries of Romsey and Stockbridge in the Test Valley are great places to try the delicious smoked trout and other local produce that comes from this pretty and sometimes overlooked area of Hampshire in the county’s west. 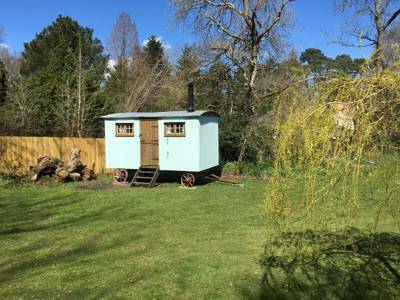 Glamping sites in Hampshire, Hampshire glampsites at Glamping in Hampshire, Whether it's secluded glamping in a gypsy caravan or a shepherd’s hut, countryside family-friendly glamping, or waterside glamping, there’s a glamping site in Hampshire with your name on it.